Get asked for Pipe and Drape? Thinking about adding it to your Inventory? Not sure where to begin? We talk to clients daily just like you who are on the fence about jumping into adding Pipe and Drape to their inventory. 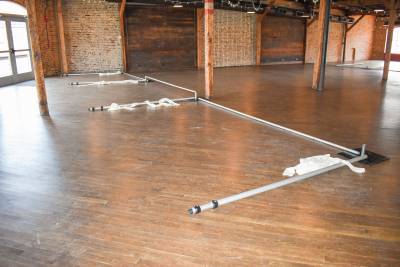 Our VP of Sales and Marketing, Amanda Gray, gets in your shoes to experiment with an install job, transforming an event hall using 200 feet of Pipe and Drape. 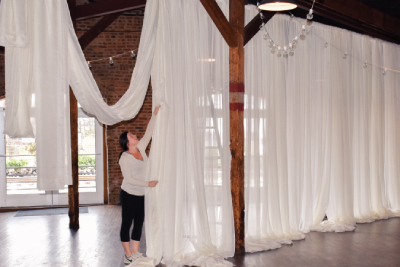 Read about the process, take a look at snapshots describing the setup, and see if taking on Pipe and Drape is for you (we think so)! The goal was to create an intimate space for a wedding ceremony that afterward would open up into a larger space for access to food, tables, and bar. 1) Where was the event held? Houston Station in Nashville, TN and we partnered with JD Davis at Southern Sky Event Lighting handled the lighting for the event and graciously offered for me to take a stab at the Pipe and Drape (which they also specialize in). 2) What materials did you use? Overall, it was about 200 feet of Pipe and Drape. I used 8’ – 14’ Slip Collar telescoping uprights, 18” x 18” bases, 6’ – 10’ drape supports, 16’ high Ivory Sheer Drape (taller than needed so the drape pools beautifully on the floor and still touches the floor when tied-back), and Ivory Poly Premier Tie Backs. To make set up even easier I used zip ties, a drape extension handle, base buggy, and a drape hamper. Tip: Having the proper storage helps tremendously when setting up, the carts become your staging area and can be moved as you move to different locations for set up. 3) About how long did the process take from start to finish? Well, I thought it would take about an hour and a half. It ended up taking me about three hours (newbie!) and things had to be adjusted of course. I started with 3 panels of sheer drape per 10’ section and after looking at it added an additional panel to each 10’ section for a total of 4 panels. Plus, I had to work with adjusting through and around the ceiling rafters and uneven floors. Spacing and fluffing drape also took some time to make it all look even and perfect. 4) What was the hardest part of the setup process? Dealing with the unexpected…for me, it was working around the ceiling rafters and AC ducts (since the setup was about 14ft high). Also, making sure all the drape supports were properly strung through any ceiling rafters with the right number of drape panels and then making minor adjustments. 5) What was the easiest part? I strung the drape at ground level and just threw the drape over the top of the support so it didn’t get dirty on the floor, doing the final raising of the slip-collars to about 14’ high was a breeze since they lock in place just by lifting on the inside pipe. Our new CastleTop® additions also saved time by just being able to put the Drape Support hook-end in the opening at the top instead of searching for the slot. The angles when adjusting upward and measuring were a lot faster too and the laser-etched ruler on the upright really helped make sure we were on point, even without eyeballing. 6) What sort of comments did the attendees have on the setup? 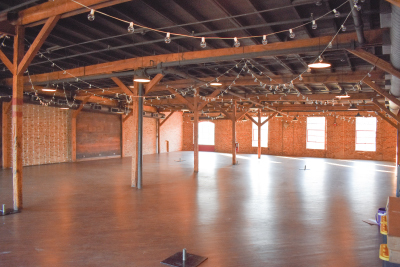 Some people who saw the before and after raved about how intimate the space became, it started as a wide open old train depot. 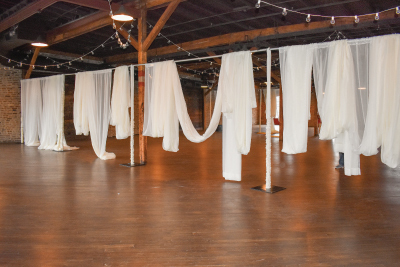 People did comment that they thought the drape was beautiful, but part of the whole design of wedding pipe and drape is that it isn’t supposed to be the focus. It is the definition of space that allows the bride and groom to be the focus, and I think we accomplished that! 7) Would you do it again? Yes, I do set up smaller spaces occasionally for video shoots, tradeshows, and other things, but I did enjoy learning what our customers do on the install side. It helps me develop products that make their business better, or their install easier and faster. I also learned that for the price of the equipment, the time for the install/breakdown that Pipe and Drape should really return an ROI within two rentals. While adding so many components to your rental line might seem daunting, or working nights and weekends, the return on the investment is very attractive. 8) What advice do you have for someone doing something similar? Upfront planning can save you a lot of time in set up. Measure the spacing and plan out where the equipment will go prior. Have a “toolkit” ready with extra drape, pipe cleaners, zip ties, a stepstool, drape extension handle, etc. Oftentimes you do have to get creative and just figure it out as you go. If you’re ready to start discussing adding Pipe and Drape to your business but aren’t sure where to start we have a team of in-house staff that would love to help you get started. We’ll listen to the types of requests you are getting, learn about what types of events you’d use Pipe and Drape for, then recommend a starter package that will have you making money in no time! Our goal is for you to be successful so you become one of our thousands of customers that comes back year after year to increase their Pipe and Drape inventory. Does My Drape Need To Be Flame Resistant?